Palo (Homepage) wrote: Amazing light & composition. Martin Belehradek (Homepage) wrote: Wonderful ligth, greath post procesing, and rigt coposition. Well done job! ronan (Homepage) wrote: quelle paysage ! une véritable ambiance de film fantastique. J'aime particulièrement le jeu des brumes. Pius Lee (Homepage) wrote: nice work! perfectly crisp where it needs to be... I feel like I can cut myself on those rocks just by looking at them. krusaf (Homepage) wrote: Great compo, nice colors, what a beautiful shot ! 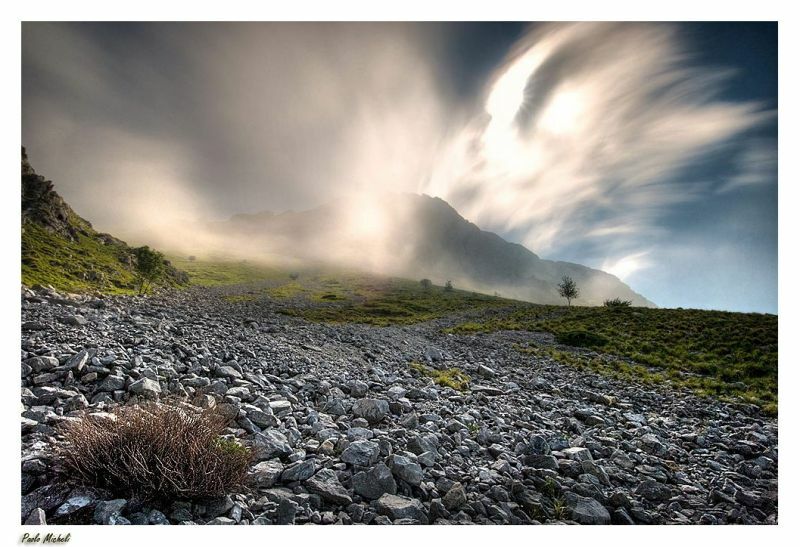 John Maslowski (Homepage) wrote: Stunning ambiance, love the radiating light and moving clouds. Great capture of this ethereal place. mbecher (Homepage) wrote: Your landscapes turn out so splendid. This is just great! Andy (Homepage) wrote: Incredible atmosphere! Love the mist hiding the mountains! Amazing photo! Laurie (Homepage) wrote: Wow! That is just beautiful. Awesome shot. cellinux (Homepage) wrote: is it on Earth, or somewhere else? beautiful! joshi daniel (Homepage) wrote: looks like some UFO is gonna land. awesome image! mario iso101 (Homepage) wrote: Nice landscape with this incredible effect in the clouds! -trond- (Homepage) wrote: Great colors and perspective in this one! Arjan - PlasticDaisy (Homepage) wrote: Yikes that does look menacing indeed! Great effect! Marcie (Homepage) wrote: What a dramatic and very creative effect. Simply gorgeous!!! grant (Homepage) wrote: the light is beautiful, and almost aggressive. beanow (Homepage) wrote: Amazing vision...Super! pernilla (Homepage) wrote: Amazing effect with the sunlight. Great capture! Abhijit (Homepage) wrote: Lovely HDR. It looks dramatic!